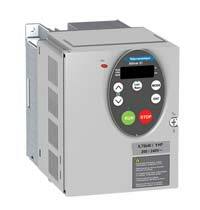 TheTelemecanique Altivar 21 variable frequency AC drive is designed for HVAC pump and fan applications. It comes with factory-configured parameters and features a local/remote button for testing and troubleshooting. It allows side-by-side mounting to save panel space and offers up to 40 hp at 240v and up to 100 hp at 480v. Its design optimizes the diode bridge and capacitance to provide harmonic mitigation without the use of additional line reactors or DC chokes. Users can integrate it into building management systems through its internally mounted option cards.